Sharing special moments in your own backyard is easy with the PPU-410-U offset Patio Umbrella from CorLiving. 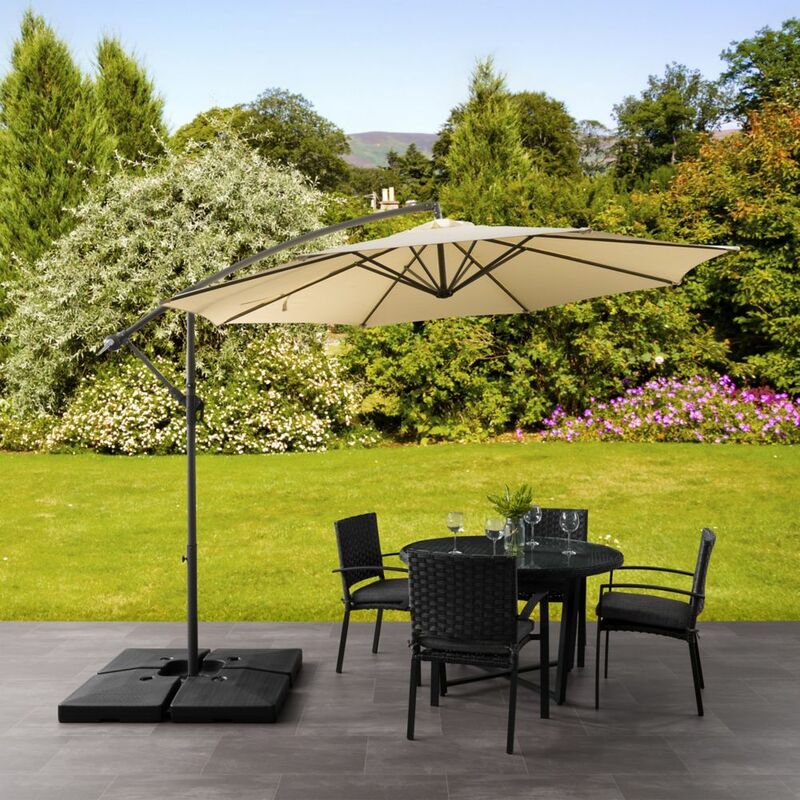 This versatile offset umbrella can be used to create a comfortable shady spot on your patio. Made with a durable steel frame and a UV resistant umbrella fabric this product looks great and is ready to withstand the elements of the outdoors. With only simple assembly needed upon delivery, means you can create your place of shade in minutes. Sharing special moments in your own backyard is easy with the PZT-734-U Patio Umbrella from CorLiving. Made with a durable wooden frame and a UV resistant umbrella fabric, this product is ready to withstand the elements of the outdoors. This unique design with solar powered LED lights will light up your patio every evening, so you can continue to relax outdoors into the warm summer nights. Share special moments in your own backyard with the PPU-360-U Patio Umbrella from CorLiving. Air vents ensure your seating area stays cool on hot summer days. Durable Grey/Black steel frames and polyester look great and will withstand the elements of the outdoors. Assembly and storage is simple with a convenient crank and pulley system. Share special moments in your own backyard with the PPU-280-U Patio Umbrella from CorLiving. Air vents and hanging side flaps ensure your seating area stays cool on hot summer days. Durable dark grey steel frames and polyester look great and will withstand the elements of the outdoors. Assembly and storage is simple with a convenient crank and pulley system. From your patio to the beach, this umbrella keeps you cool and protects you from the sun with its UV resistant fabric. This beach umbrella doubles as a patio umbrella for added versatility. The vented canopy and wind tension setting provides added stability during windy days. Included is a carry bag that makes it easy to move and store. Offset Patio Umbrella in Warm White Sharing special moments in your own backyard is easy with the PPU-410-U offset Patio Umbrella from CorLiving. This versatile offset umbrella can be used to create a comfortable shady spot on your patio. Made with a durable steel frame and a UV resistant umbrella fabric this product looks great and is ready to withstand the elements of the outdoors. With only simple assembly needed upon delivery, means you can create your place of shade in minutes. Offset Patio Umbrella in Warm White is rated 2.3 out of 5 by 3. Rated 3 out of 5 by Avid Gardener from Economical Functional but not as sturdy or robust as some of the higher end models available. Rated 3 out of 5 by Camilard from I think I'll get what I pay for Although nothing major has gone wrong I think compared to a more expensive cantilever umbrella this one will not last as long. I've had this umbrella for about 2 months and in some places the plastic looks 'stressed' (don't know how to better explain it but I'm sure you know what I'm talking about - when plastic bends it kind of gets a whitish colour in the spots it's stretched). Stil holds wel but can't imagine that wil last more than a few summers. Another thing that annoyed me was the description of 'weight needed for base'. It said minimum 120lbs but if there was even a slight breeze would want to tip over. Would recommend much more weight to feel safe - we did about 200lbs of patio blocks It works, it looks good. Just not certain how long it wil last. But for the $200 (ish) I paid I don't think I should expect more.